That’s right I am channeling that happy place from childhood when I sat in front of the TV watching my favorite cartoons. And like that adorable sweet St. Bernard, I too needed direction when I started on a layout in which I had no color direction. At times when the photos require certain colors, I will gravitate towards patterns and colors that will highlight the photos. If you have visited my blog at all before today, you will see that I lean towards more portrait photography especially of my sweet fur babies, so generally my photos are not the first place to go for color inspiration. With that being said, my scrapbook method starts with a patterned paper or two (and lets be honest, my blog is not named just the paper for nothing) and then the rest of the layout builds from the color found in one of those chosen papers. 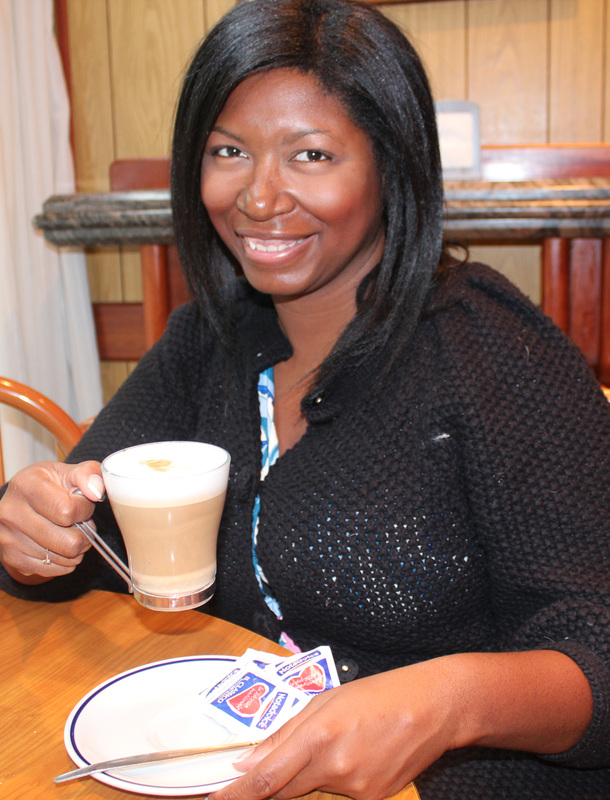 I decided to scrapbook a photo of me sitting in a cafe’ in Venice, Italy. I was wearing a black sweater and between my skin color, the latte and the wood paneling behind me, you just get lots of shades of brown. Hum, brown and black is not the most uplifting of color schemes. A little too blah for my taste. Well, lets see where we can go with the patterned paper. I have been hoarding mindfully holding onto some American Crafts Soho Garden collection. The bold jewel tones just speak to me. (And they are saying, “Must Scrap.”) As I was flipping through the 6×6 pad, the High Line Park patterned paper just immediately made me happy. 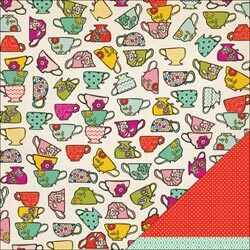 I love all of the beautiful blend of the various bright patterns in the collection all on one page, especially coupled with those adorable cup graphic.So here it is: The Color Inspiration for the layout. The problem is that these two things (color inspiration patterned paper and the photo) are somewhat polar opposites- bright and somber. To settle the dilemma and make these two play well together, I first went through the rest of the 6×6 pad to look at the rest of the collection. I decided on a simple “here is 1 for you, and here is 1 for you” selection. I chose two patterned paper that blended well with the color inspiration paper and then did the same for the photo. What resulted is scrapboook magic. Title: italiano. 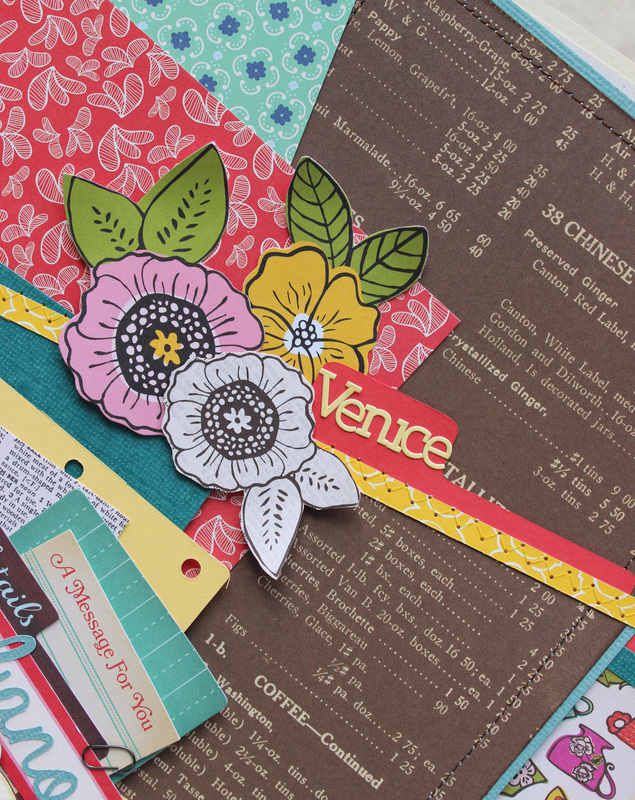 Cardstock: American Crafts (surf, banana) Neenah (classic crest natural white), Bazzill (crème, grenadine). Patterned Paper: American Crafts-Soho Garden (Tribeca, 6×6 paper pad- High Line Park, Grande Street, Park Avenue, West Broadway, Eldridge Street, Canal Street), Studio Calico-Autumn Press (Preserves). Stamps: Hero Arts (envelope pattern background stamp), Teresa Collins-Summer Story (clear stamps). 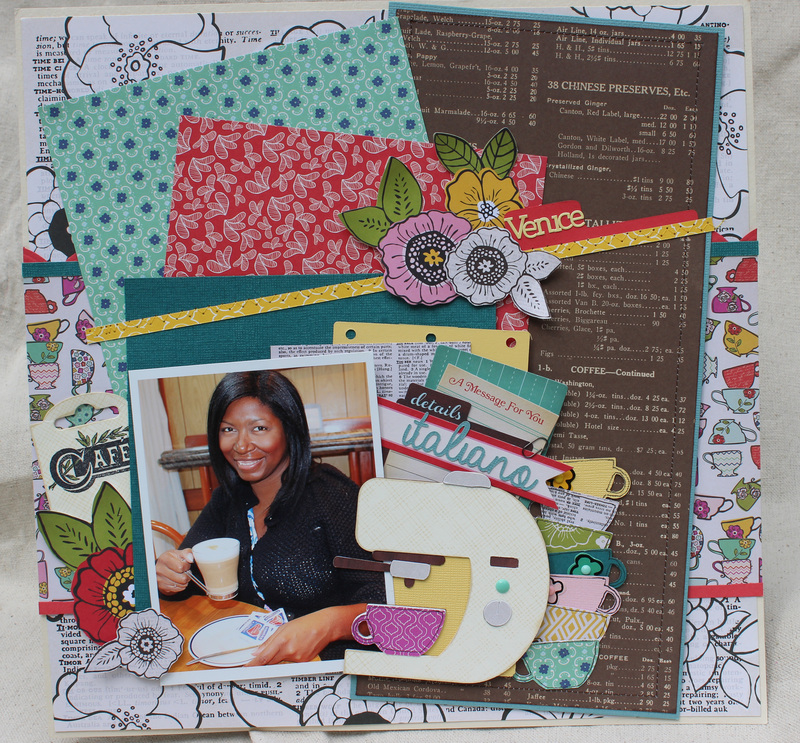 Die Cut & Punches: Cricut Love You Latte (espresso machine and cups cut at 3 ½), Quickutz (Santa’s workshop die cut wintergreen), Lifestyle Crafts (Tag it Kit), Silhouette (3 tabbed borders-Design #19323). 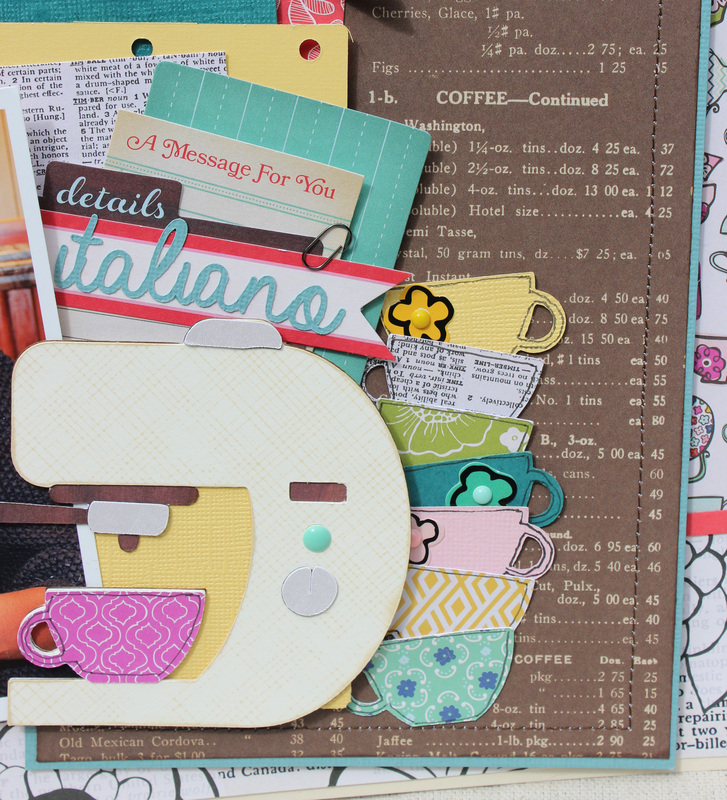 Embellishments: American Crafts Soho Garden (die cut cardstock shapes, poppy district remark stickers), Basic Grey for Studio Calico (small yellow letter stickers), Tim Holtz Ideology (tiny clips), My Mind’s Eye- Collectable (enamel dots). Markers: Stampin Up (pear pizzazz). Inks: Hero Arts Shadow Ink (soft sand).